Yes, the options selected above are correct. 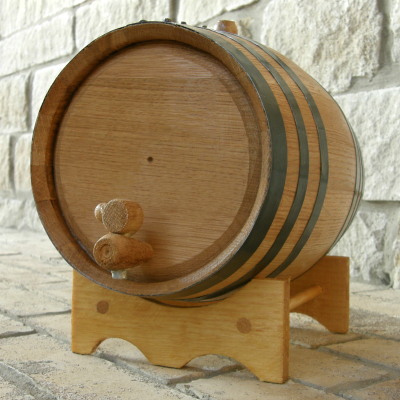 Use this Mini Oak Barrel for decor or to serve or age your favorite whiskey or other spirit. This barrel ships in 1 to 2 business days. Our small oak barrels are handcrafted from premium quality American white oak, the same that most wineries and distillers use, are charred inside and comes with a series of black steel hoops around the barrel. Color of the barrel is medium toast and comes with a wood stand, bung, and wooden spigot. Perfect for aging and or serving whiskey, scotch, bourbon, tequila, brandy, rum, cognac, other spirits, wine, beer, barrel aged cocktails (no citrus or dairy ingredients though), wine, homemade hot sauce or tabasco sauce, balsamic vinegar and even barbeque sauce. Note - This particular barrel comes with no engraving, hence the lower price. View our Small Oak Barrels section to see our entire collection of mini oak barrel designs. Many fantastic designs to choose from. ADD a Cleaning and Care Kit: One kit good for 1-5 liter size barrels. For larger sized barrels, such as 10 and 20 liter barrels, you may want to purchase a second kit. Cleaning kit includes: 1oz of Oxy-San, 1oz of Citric Acid, 1oz of Barrel Wax & 4 Campden Sterilizing/Storing Tablets. Instructions come with every kit. For more information about the the cleaning and care kit, see Cleaning and Care Kit Information for Small Oak Barrels - SOLD OUT *Note - All products in this kit are made by the same manufacturer. Suppliers vary due to product availability.